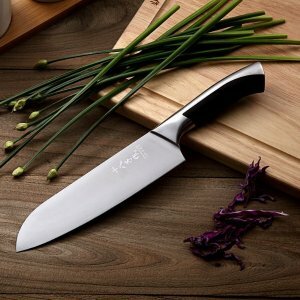 Amazon.com offers the 7 Inch Santoku Knife Stainless Steel Vegetable Meat Knife with ABS Handle for $24.03 via coupon code SHIBAZI1 . Features: 3-layer laminated stainless steel (Core steel: 80Cr13, HRC: 56-58) make the knife extremely sharp and maintains a long time serving life, rustproof. Forged blade and hand-made sharpened blade edge. ABS cast steel handle is hygienic and comfortable to grip. This knife is suitable for cutting, slicing, and dicing meat, vegetable and poultry cartilage. To protect the blade edge, please do not use it to chop any hard material and hand wash is recommended. About SHI BA ZI ZUO: SHI BA ZI ZUO, owned by Yangjiang Shibazi Group, is one of the top kitchen knife brands in China. For the past 35 years, Shibazi develops from a small workshop to an advanced modern enterprise with wide range of kitchen tools.